Chrichton's World: Review Dead Silence (2007): Excellent atmospheric horror! 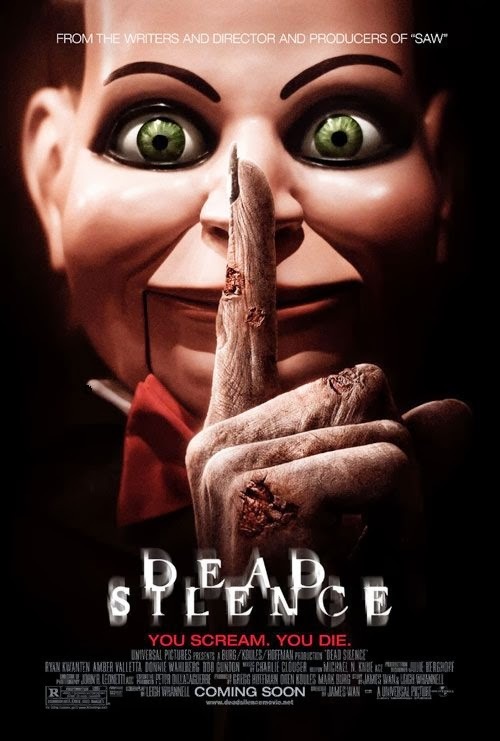 Review Dead Silence (2007): Excellent atmospheric horror! James Wan's went into another direction after his Saw. Of course people were hoping for more of the same of what Saw provided. Luckily James Want wanted to have an old school approach where the thrills were more reliant on atmosphere instead of gore and brutality. From the start you will be drawn into the story. The story has some flaws in continuity and background. But this can be overlooked since you will get a very entertaining movie that is full of suspense and scares. For an experienced viewer most scary moments you can see coming. One example is the fact that when the evil arrives the sound from the surroundings becomes silent. This is a very cool effect but warns the viewer of the danger. The dolls play a major role in this movie and are quite effective as a tool to scare us. I lived in a town where some doll lovers hanged their collection of dolls on their wall outside. When I would pass this house it looked like these dolls were looking back at me and following me with their eyes. Of course they didn't but they creeped me out big time! The movie does this in the same way and adds more on this story wise. Dead Silence could have been a lot scarier, but for the most part it is an perfect example of a good horror movie where buildup of tension is far more effective than the use of visual violence. After having re watched this for a second time I have to say that even knowing how it plays out and ends, it remains to be a pleasant and very good watch. In fact Dead Silence in my opinion is a little gem deserving more praise since it was obvious that James Wan had the right vision when making horror resulting in the brilliant Insidious.